"Blessed are your eyes, for they see. And blessed are your ears for they hear." Saints Joachim and Ann, elderly parents of Mary the Mother of our Savior and heavenly patrons of generosity to new life, pray for us. May all open their eyes and ears to see and hear Jesus Christ teaching in His Church, especially in regard to the holy embrace of husband and wife, called to be radically open always to new life. Amen. Feast of Saint James: "Can you drink the chalice..."
... that I am going to drink?" Those who exercise authority should do so as a service. "Whoever would be great among you must be your servant." The exercise of authority is measured morally in terms of its divine origin, its reasonable nature and its specific object. No one can command or establish what is contrary to the dignity of persons and the natural law. 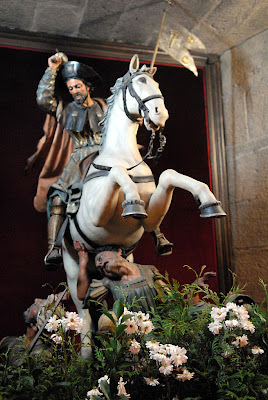 Photo by Michael Krier: Saint James at Santiago de Compostela, Spain. Saint Sharbel Makhluf: "Blessed they who dwell in your house!" ... continually they praise you. Without always professing the three evangelical counsels publicly, hermits "devote their life to the praise of God and salvation of the world through a stricter separation from the world, the silence of solitude and assiduous prayer and penance." 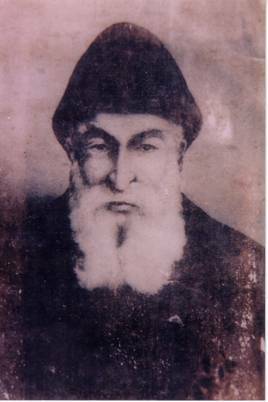 For more on Saint Sharbel at Vultus Christi blog click here. S Mary Magdalene: "I sought Him whom my heart loves"
I found Him whom my heart loves. 1391 Holy Communion augments our union with Christ. The principal fruit of receiving the Eucharist in Holy Communion is an intimate union with Christ Jesus. Indeed, the Lord said: "He who eats my flesh and drinks my blood abides in me, and I in him." Life in Christ has its foundation in the Eucharistic banquet: "As the living Father sent me, and I live because of the Father, so he who eats me will live because of me." Saint Mary Magdalene discovered the love that is the deepest, most true and most satisfying of all loves: Jesus Christ and, as for all of us, Him truly present in the Eucharist. She returned that love in the only way possible: this Love above all loves informed and formed her life, truly transforming her into the greatest of all lovers, a saint. Let us pray that this greatest of all loves, the Love that IS, will be our treasure, the power which transforms our lives as well. 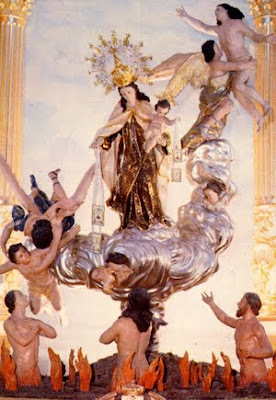 Our Lady of Mount Carmel: "something greater than the temple is here"
Only the divine identity of Jesus' person can justify so absolute a claim as "He who is not with me is against me"; and his saying that there was in him "something greater than Jonah,. . . greater than Solomon", something "greater than the Temple"; his reminder that David had called the Messiah his Lord, and his affirmations, "Before Abraham was, I AM", and even "I and the Father are one." 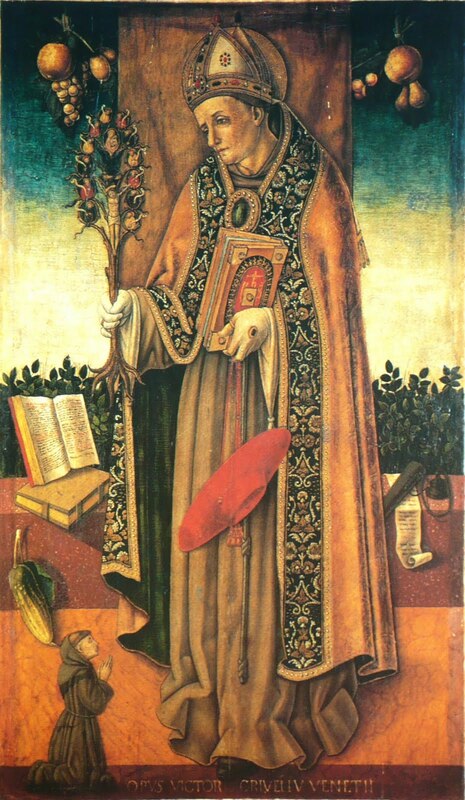 Saint Bonaventure: "My soul yearns for you in the night"
" ... yes, my spirit within me keeps vigil for you." This one, true God, of his own goodness and "almighty power", not for increasing his own beatitude, nor for attaining his perfection, but in order to manifest this perfection through the benefits which he bestows on creatures, with absolute freedom of counsel "and from the beginning of time, made out of nothing both orders of creatures, the spiritual and the corporeal. . ."
“The duty of making oneself a neighbor to others and actively serving them becomes even more urgent when it involves the disadvantaged, in whatever area this may be. ‘As you did it to one of the least of these my brethren, you did it to me.’"
"He who has two coats, let him share with him who has none and he who has food must do likewise. But give for alms those things which are within; and behold, everything is clean for you. If a brother or sister is ill-clad and in lack of daily food, and one of you says to them, "Go in peace, be warmed and filled," without giving them the things needed for the body, what does it profit?" 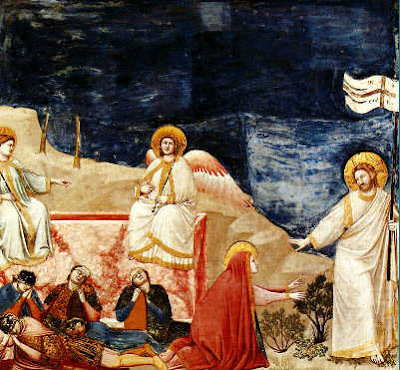 "I am sending you like sheep in the midst of wolves"
Saint Benedict: "No disciple is above his teacher"
What I say to you in the darkness, speak in the light; what you hear whispered, proclaim on the housetops. And do not be afraid of those who kill the body but cannot kill the soul; rather, be afraid of the one who can destroy both soul and body in Gehenna. 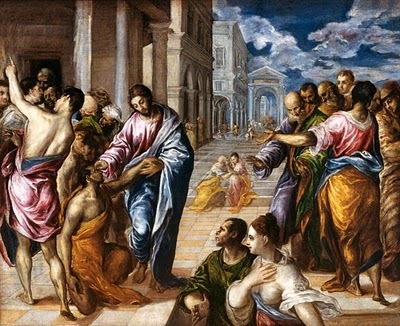 The disciple of Christ must not only keep the faith and live on it, but also profess it, confidently bear witness to it, and spread it: "All however must be prepared to confess Christ before men and to follow him along the way of the Cross, amidst the persecutions which the Church never lacks." Service of and witness to the faith are necessary for salvation: "So every one who acknowledges me before men, I also will acknowledge before my Father who is in heaven; but whoever denies me before men, I also will deny before my Father who is in heaven." 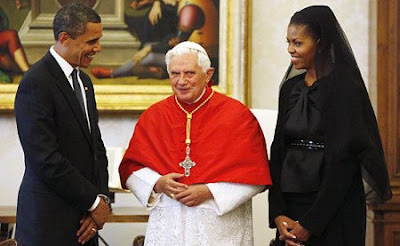 Photo by Ghanbari/AP: President and Mrs. Obama meet Pope Benedict XVI yesterday at the Apostolic Palace, Vatican City. "Jesus sent out these Twelve"
"His heart was moved with pity"
The Holy Spirit is humble, having subjected Himself in Christ as the Divine Servant of His Body the Church for our salvation. In his new encyclical letter,Lumen Fidei, Pope Francis opens for us the mystery of faith through the symbol of light which Christ used to describe Himself His mission as Savior: "I am the Light of the World." The common path of faith in the Church is made possible by the shared light of Jesus Christ. The Suffering servanthood of Christ as universal Savior continues through the indwelling Holy Spirit in the Church today, that Person of the Trinity which makes possible any sharing in Christ's light of grace. The sacramental life, prepared for by the proclamation of the Word, which are the two principal building blocks of Catholic liturgy, are the works of the Spirit in the Church, the place of faith. In order to make possible the work of the Spirit in this way Christ the Lord instituted the sacramental ministry of priesthood so that the Body of Christ would be built up in that same Spirit for the salvation of the world. We are called to humbly receive this gift and to humbly offer this gift to others, having received so that we may in turn give as does the Lord. Pope Francis continually urges us to find rejoicing not in looking inward but rather in going out to the margins of faith, seeking others as Christ urges us in His love, to build up His Body. We cannot do this on our own, but only in Christ. The Spirit is subjected to the ministry of priests so that celebrating the Eucharist and giving the Body of Christ to His people, they may then go out, taking Him by graced prayer and service, to others. In this way, we learn not to rejoice that the Holy Spirit is subjected to us in the life of Christ but that our names are written in heaven. We look forward, in the journey of Faith, to the Kingdom of heaven, faith's goal. Praised be Jesus Christ, now and forever. Follow Father Cusick on Facebook at Reverendo Padre-Kevin Michael Cusick and on Twitter @MCITL. Saint Maria Goretti: "How long will they be unable to attain innocence?"